A. The answer to this question would depend on where you live as well as what species of bird you are referring to. 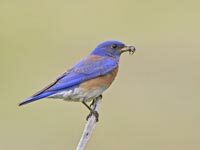 A recent study released by the National Audubon Society states that many birds are experiencing population declines including the evening grosbeak, boreal chickadee and the eastern meadowlark. According to the study, many of the species facing declines rely on the boreal forest which is being impacted by activities such as logging, mining and drilling. Development and the use of pesticides can also seriously impact bird populations. Want to learn more about birds in Canada? Order one, or both, of our free Wild About Birds posters!